An environmental geologist, author and educator, I report on clean energy technologies and communicate big ideas for young and old alike. 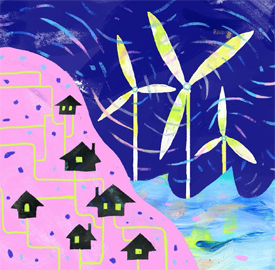 I teach environmentally-focused units to school children and enjoy promoting "When the Wind Blows" (Holiday House, 2015), my rhyming, renewable energy adventure for kids aged 2-8. As a field geologist, I took a lead role in assessing and reporting the human health risks associated with industrial land in New England and the UK. The Co-operative Bank of Manchester, England hired me to build a lending policy aimed at reducing their exposure to high risk properties. The presentation of the policy across England and Wales was notable owing to my pending pregnancy (my now 23-year-old son and Microsoft coder, was born a week following the tour). Major influences leading to this career were a Harvard University School of Public Health internship, where I contributed as a researcher and writer to an EPA-funded study of town well contamination in Woburn, MA (a 1982 Superfund site later adapted as the movie, A Civil Action.) and an internship supporting Earth Science students at Stanford University model solutions for protecting fresh water aquifers in CA's Salinas Valley. During the 2010 BP Oil tragedy in the Gulf of Mexico, I began my role as a blogger for Energy Boom, and, later, as a Huffington Post contributer, focusing on the economic logic of growing the nation's clean energy infrastructure. One memorable interview was with Billy Nungesser, the charismatic, highly vocal former president of Plaquemines Parish (now LT Governor of Louisiana), whose public presence in the wake of the Deepwater Horizon well blowout drew sustained media attention to his coastline community. I continue to interview experts and report on clean energy innovations, particularly the ascent of wind and solar power and the potential for wave and tidal power to supply abundant amounts of carbon-free electricity to coastal cities and towns. I am currently teaching as well as advising a newly elected state representative on a bottom-up climate solution that engages his state's constituents to support infrastructure build-outs of clean electricity and the jobs that support the new energy economy. Please contact me at StacyDallasTX@gmail.com. Powered by 100% Wind Power! © 2019 Dallas Writer. All Rights Reserved.